TechSnab is the PUP that uses misleading techniques to prevent removal. Use Reimage to locate malicious components and get rid of them faster than with uninstall instructions. A full system scan blocks virus reappearance and prevents traffic to malicious domains. How did TechSnab hijack my PC? If you haven’t come across TechSnab virus yet, then you can consider yourself lucky. This application is classified as quite aggressive adware-type program, which promotes suspicious domains. Therefore, it means that it can bombard your browser with intrusive ads, coupons, and other annoying commercial offers filled with links of third parties. Alternatively known as TechSnab chrome launcher, it attaches its plug-in to your browser and starts displaying sponsored advertisements. Due to this behavior, your browser’s speed may significantly decrease. That is why, if you detected this program on your computer, make a rush to remove TechSnab from the system. Likewise, you’ll need a powerful tool to do it. In this case, consider using Reimage, for instance. It is known that TechSnab Ltd is the author of this adware, which is located in Belarus. IT security specialists suspect that the company has launched countless number of similar applications, so keep in mind that you may run into one of their “products” without even thinking. How? You you can install TechSnab adware or similar PUP from this company after being convinced that it is a useful software. However, after some time, you may notice that the only thing it causes is sponsored advertisements. Moreover, TechSnab ads can replace the commercial offers generated by other advertising companies. As a result, if you are a passionate shopper, such peculiarity may lead you unpleasant consequences. Additionally, the program is troublesome due to TechSnab redirect issue, which is usually initiated with the help of its ads. We should warn you that you may find yourself not only on useless commercial web pages but malicious websites as well. On their behalf, the websites might provide a shelter for unwanted malware, such as trojans, worms or even ransomware. If your computer gets tangled up with one of them, it may need to spend lots of time eliminating this virus from your computer. Additionally, you should beware of TechSnab ads offering you update the existing applications on your computer. The adware redirects you to the websites which offer malicious updates on popular programs. For example, Java program is quite a frequent target for many scammers to attach their unnecessary programs to it. In other words, you should download the updates for your programs only from official websites rather than secondary web pages. If you remain vigilant, you can escape the trouble deleting unknown programs and files from your computer. All in all, you need to perform TechSnab removal before the application roots deeper on your system. 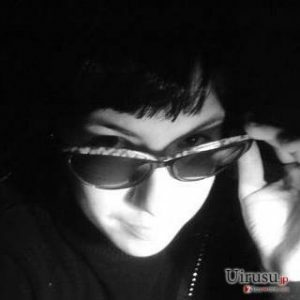 Usually, potentially unwanted applications like TechSnab virus are spread via bundling technique, or, in other words, it can reach users’ computers via other free programs. It may come along with such applications as PDF creators, audio format converters, download managers and other similar applications. 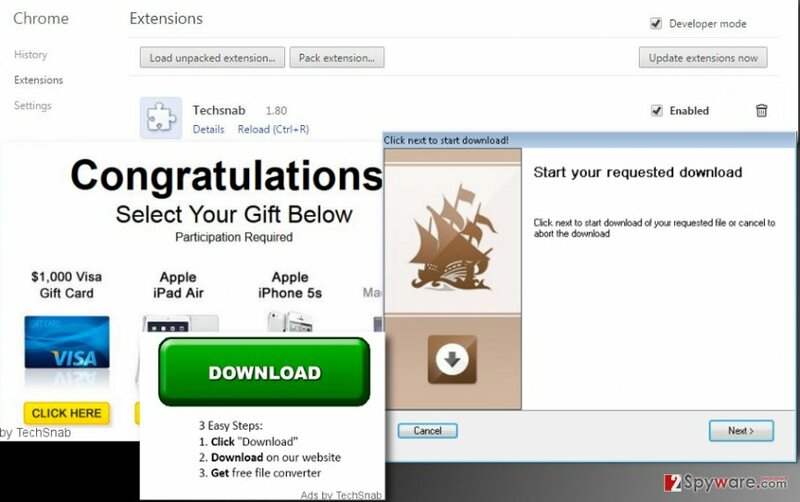 If you happened to download one of them recently, then, most likely, you overlook TechSnab attachment as it was already pre-marked, the adware easily found its way into your system. Thus, we offer an alternative way of installing programs in a more secure way. Choose “Advanced/Custom” installation mode and then deselect unnecessary optional apps. We also advise you NOT to rely on Default/Standard/Basic installation settings. Finally, you should be careful when you launch an installer of any free app. There are two ways to delete TechSnab virus. You can uninstall it either automatically or manually. If you are an experienced PC user, try removing this intruder manually. We have provided a manual removal guide beneath this article to help you deal with the adware. However, if you feel that these manual removal guidelines confuse you, you might want to opt for the automatic elimination method. The latter option might be the fastest and most efficient way to remove TechSnab – all you need to do is to install anti-spyware software, start a system scant and then remove the program with a single click. Lastly, you should remember that though anti-spyware program provides real-time protection, cautiousness is a virtue surfing the vast fields of the Internet. Here, look for TechSnab or any other recently installed suspicious programs. Wait until you see Applications folder and look for TechSnab or any other suspicious programs on it. Now right click on every of such entries and select Move to Trash. When in the new window, check Delete personal settings and select Reset again to complete TechSnab removal. Once these steps are finished, TechSnab should be removed from your Microsoft Edge browser. Here, select TechSnab and other questionable plugins. Click Remove to delete these entries. Now you will see Reset Firefox to its default state message with Reset Firefox button. Click this button for several times and complete TechSnab removal. Here, select TechSnab and other malicious plugins and select trash icon to delete these entries. Click Reset to confirm this action and complete TechSnab removal. Here, select Extensions and look for TechSnab or other suspicious entries. Click on the Uninstall button to get rid each of them. Now you will see a detailed dialog window filled with reset options. All of those options are usually checked, but you can specify which of them you want to reset. Click the Reset button to complete TechSnab removal process. This entry was posted on 2016-04-14 at 03:22 and is filed under Adware, Viruses. You can quickly scan the QR code with your mobile device and have TechSnab ads manual removal instructions right in your pocket. How did you remove TechSnab ads?